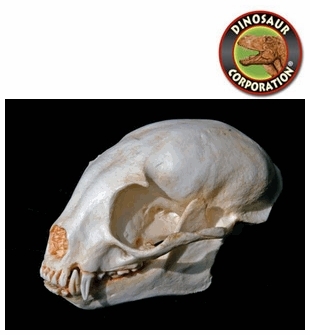 Kinkajou Honey Bear Skull. Potos flavus CARNIVORA Procynidae single species. The kinkajou (Potos flavus) is a rainforest mammal of the family Procyonidae related to olingos, coatis, raccoons, and the ringtail and cacomistle. It is the only member of the genus Potos and is also known as the "honey bear" (a name that it shares with the sun bear).